It is that time again. The 100 day project starts April 2. I have decided to participate simply because I want to spend more time creating art. This is the best way I know to build a consistent habit of making art on a regular basis. You do it daily for a long time, like 100 days and it becomes just something you do. As some of you readers may know, I started the 100 day project in 2015 and kept going until December 2017. I stopped the daily creating because I needed a break. However, the last two years I’ve struggled to get into the studio consistently. I’ve tried adding projects to my to-do list and to my calendar. Some were successful like my Four Seasons project. But I struggled to recreate the wheel and get my motivation going after every project. But right now I think the best thing for me is to participate in the 100 day project again. My 2019 project is 100 days of 4 colors where I focus on 4 colors overall, one color every 25 days. 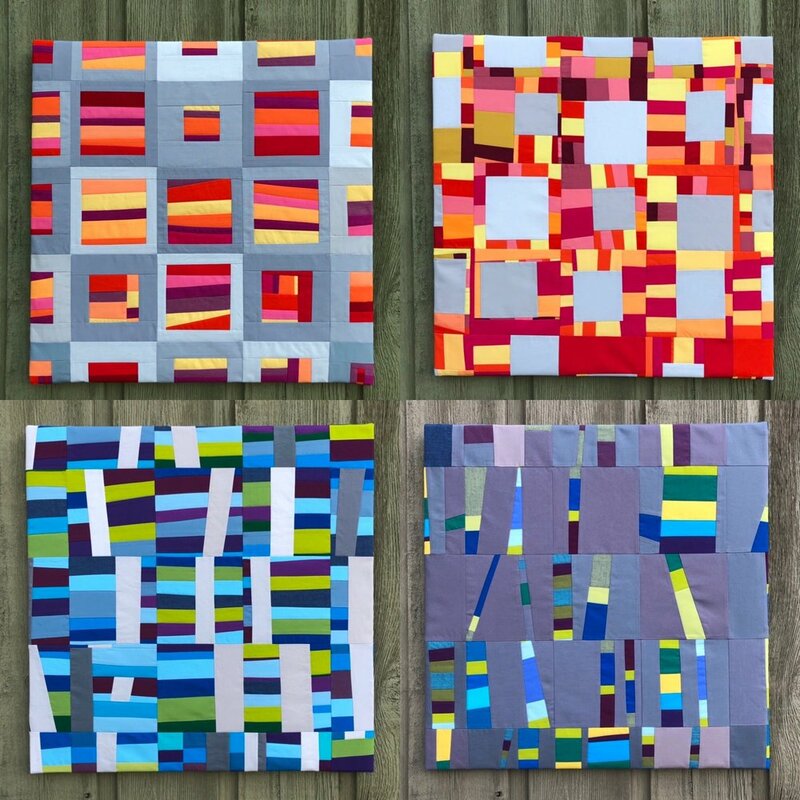 I will create small squares of fabric art each day and assemble them into 1 large piece for each color. My colors are green, blue, orange and purple. I’ve already selected six fabrics for each color in lights, mediums and darks. For the design, I am using the loose term of horizontal trending or vertical trending. The blue represents the Sky and the green represents Grass. These two will be horizontal trending. The orange represents Poppies and the purple represents Lavender. Since they represent flowers, they will have a vertical trend. As I’ve written about many times, I am always trying to find a perfect balance of some guidelines and a lot of freedom. I’m hoping that I have achieved that balance for this project. The colors and design are set but what I actually create within these parameters is the reason I will walk into the studio every day. If you are interested in participating, here is a Reflection Guide from the 100 Day Project people to help you plan out your project in a realistic way. There will be a newsletter from the 100 day project organizers as always but this year the organizers will have podcasts and a Facebook page to help build community. I found this Reflection Guide helpful because it encourages you to set your intentions and why you’re doing this. For me, I just want to get into the daily habit of creating again. Simple intention and I am open to the possibilities because I know being part of a creative community such as the 100 day project community is awesome. I have included images of the 100 day projects over the years.